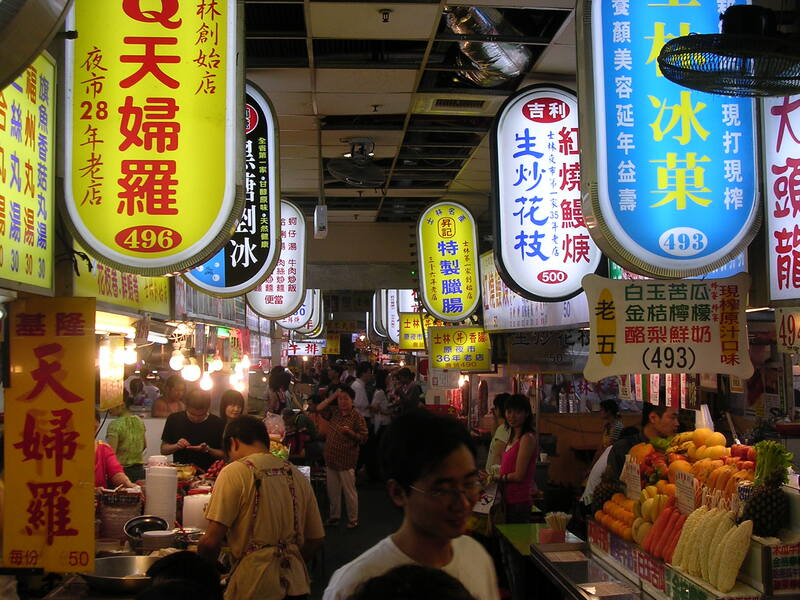 Taiwan as a country is food mad and you will find all tastes catered for in its big cities. This is in part due to the diverse external influences over the past 500 years, from the Spanish and Dutch colonialists in the 17th century to the Japanese and Americans in the 20th century, and Chinese Qing dynasty in between. As a result, those staying in large hotels will be well attended with numerous restaurants serving multiple Chinese, western and other international cuisines. 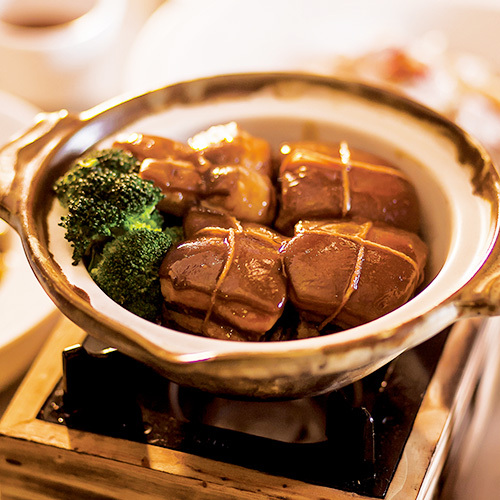 Taiwanese cuisine itself ranges from classical Chinese dining through the popular “Taiwan buffet” to a cornucopia of street food, including some more exotic dishes served on the country’s popular night markets. Rice and noodles are at the heart of sit-down meals, the former usually presented individually in a small bowl alongside main dishes, which are served communally on a turntable at the centre of the dining table. Large shopping malls and department stores are ubiquitous in big cities and most will have a basement food court with any number of outlets serving food to be consumed either on their own tables or in the communal seating area. Many of these outlets, such as in the basement of the Taipei 101 shopping mall, will feature the incredibly detailed Japanese-style fake plastic food, that is so realistic you would be hard put to tell the difference without touching it. 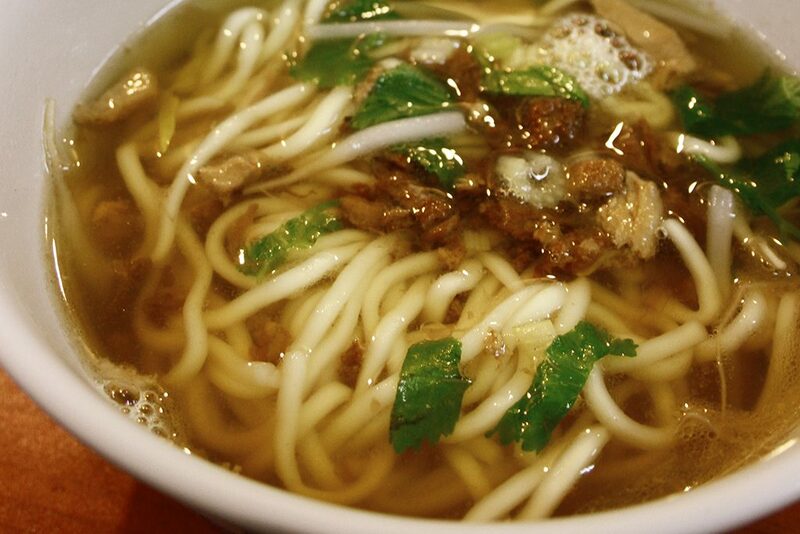 The really interesting side of Taiwanese food is on the street, however. 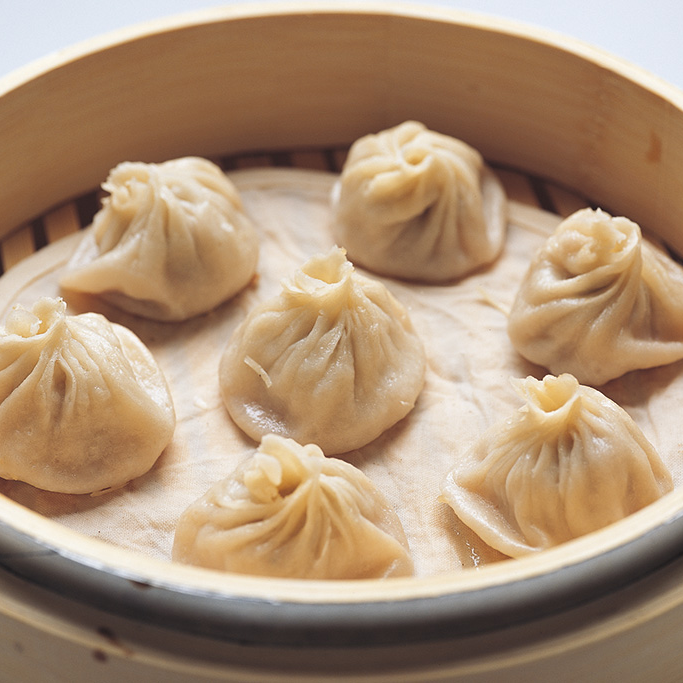 Convenience is the watchword for Taiwan and eating out and is very affordable. Locals and expats are likely to both eat out and bring cooked food home several times a week – perhaps more often than not, to the extent that many young or single people live in accommodation with little more than a kettle for a kitchen. 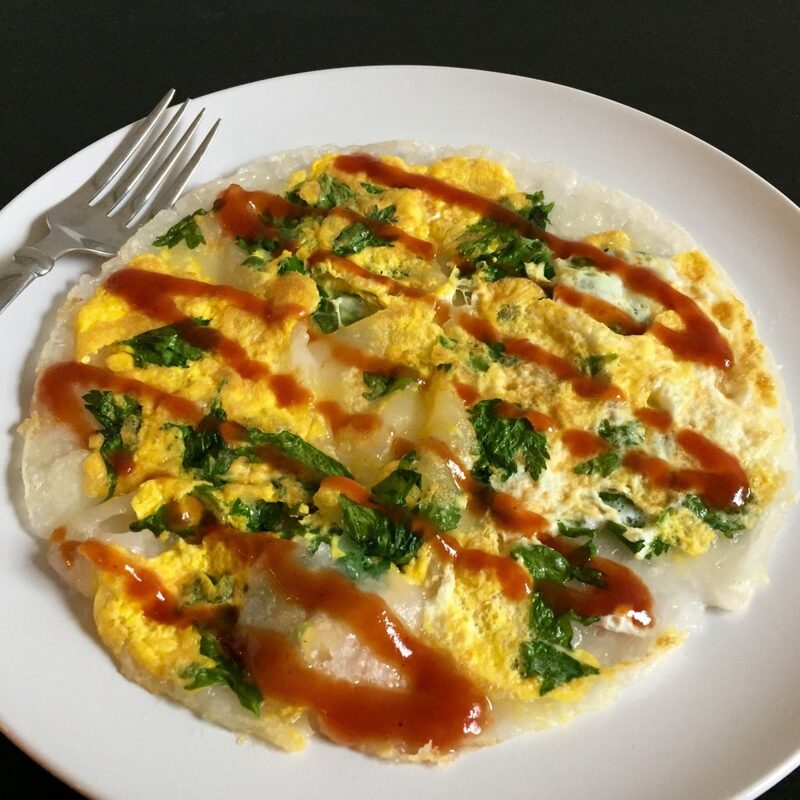 Breakfast, bought off the street, may well involve dan-bing – a kind of pancake fried with an egg, steamed buns, hash browns, a Taiwanese take on a toasted white bread sandwich and other rice and bread-based dishes. Cooked rice is also often taken home to serve with the rest of the meal prepared at home. 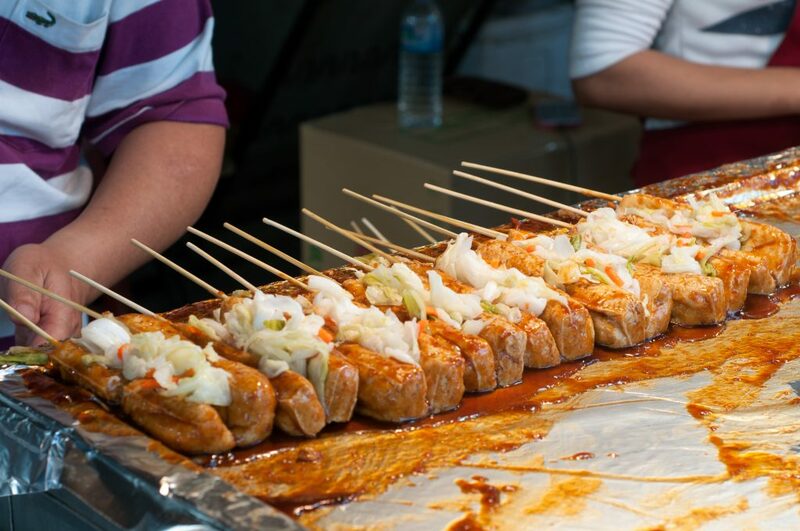 This popular snack is available at just about every night market in Taiwan. The fresh oysters are coated in potato starch and tapioca and eggs and leafy vegetables are added to the mixture, which is skillet fried over a high flame. A sweet and sour sauce adds to the taste. 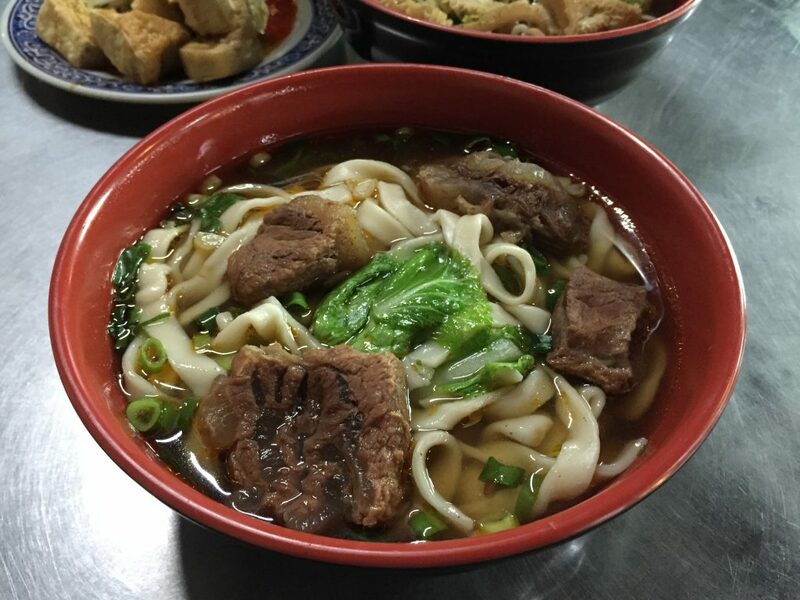 Beef noodle soup is an absolute Taiwanese classic, considered to be a national dish, to the extent that there is an annual beef noodle festival in Taipei. Nutritious and full flavoured, it is made from braised beef in a broth of garlic, ginger, chilli star anise and other Chinese spices, tomato and soy sauce. Great as a winter warmer or at any other time of year. Stinky tofu can perhaps be compared to blue cheese – it is literally curd that has been allowed to ferment. It is something of an acquired taste but and while many people are put off by the smell, those who take the plunge are usually won over. Stinky tofu is made of large cubes of tofu deep fried and served with a garnish of pickled cabbage, garlic and ginger. The tofu’s crisp skin and the soft inside add texture to the strong flavour. 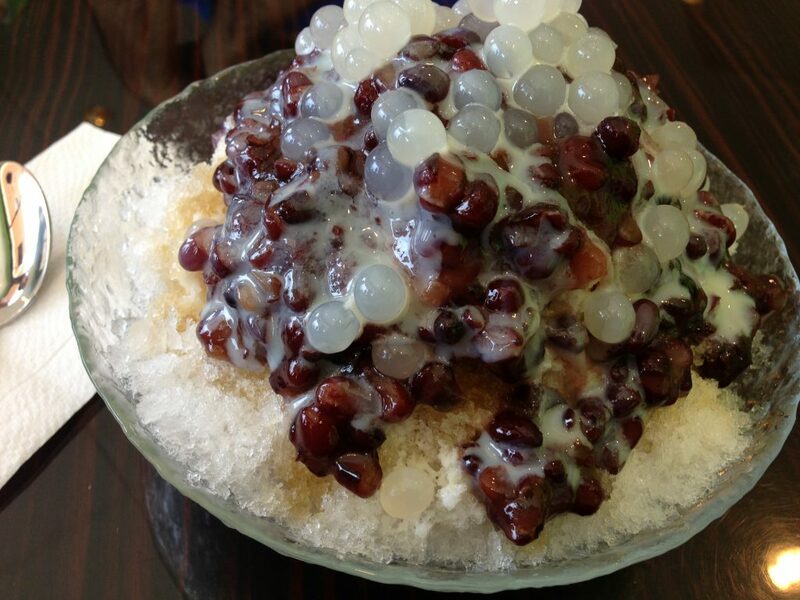 Another night market favourite, shaved ice deserts have a base of crushed ice flavoured with mung beans, adzuki beans, starch balls, taro, jelly and other toppings sprinkled with sugar water, offering cool, sweet relief on a hot summer day. Variations have toppings of mangoes, strawberries and other seasonal fruit. Also known as “Bubble milk tea,” this drink is making inroads in the UK. Black, white, green or oolong tea, is served with varying degrees of sugar or other flavourings and tapioca starch balls or fruit jelly cubes, which are sucked up through oversized straws. Served hot or cold, pearl milk tea makes a refreshing drink in winter or summer. A wide range of tropical fruits are grown in Taiwan, including deliciously sweet pineapple – a world away from anything you’ve experienced out of a tin. With its butter pastry, egg, sugar and pineapple jam, fènglí sū or pineapple cake has a melt-in-the-mouth skin with a soft but textured pineapple’s inside. Mochi (sticky rice cake) is made from balls of a chewy rice flour paste with a sweet or savoury filling such as green or red bean, sesame or green tea. The Mochi are often dusted with sesame seeds, ground peanuts or icing sugar. As with many Asian desserts, they are subtle in flavour and not overpoweringly sweet. They can be served hot or cold and sometimes in a slightly sweet soup called tangyuan. A ubiquitous snack on night markets and convenience stores in Taiwan, these are eggs that have been slow-boiled in a spicy mix of soy sauce and teabags containing black tea, star anise, fennel seeds and other spices. Available in the 7-11, Family Mart, Hi-Life or OK Mart convenience stores 24-7, or on night markets, they are easy to shell since the outer layer has already cracked, making a quick, convenient snack. Quails eggs make a nice variation and iron eggs are a darker, chewier speciality of Tamsui. If you’re feeling more adventurous, century eggs have a much stronger flavour – definitely on the acquired taste side of things. Taiwanese love to eat these at Dragon Boat Festival (the 5th day of the 5th lunar month – in 2018, 18 June). Bamboo leaves in the shape of a pyramid (technically a tetrahedron or triangular pyramid) enclose glutinous or sticky rice with a treat in the middle. This can be based on pork, shrimp, nuts, mushrooms or many others. They are common across China and east Asia, but of course the Taiwanese ones are the best. Though these are technically Japanese styles of dining, the Taiwanese have very much made them their own. Customers at a shabu shabu restaurant choose a selection of uncooked meats, vegetables and sauces that are delivered to their table with a hotpot, in which they cook the food at leisure. The name comes from the bubbling noise of the pot. Shabu shabu makes a great interactive way of dining and outlets come in all levels of sophistication, from the night market diner to high end restaurant. A good vegetarian option in Asia as you cook it yourself. Teppanyaki is cooked and served in real time over a hotplate bar and is great for those who like to see their food cooked. Steak strips, shrimp mixed vegetables and mushrooms are common ingredients. Great for meat lovers and vegetarians alike – so long as they don’t mind their food being cooked on surfaces also used for meat. A great late night, or daytime bready snack, zhua bing is made from a dough mixture fried on a flat griddle and then twisted and crushed between two spatulas to break up the crispy surfaces. Often served with egg, cheese and chilli sauce, they are usually rolled or wrapped up in the shape of an omelette they make a great stomach filler with flavour, texture and substance. They are similar to the thinner dan bing (egg pancake).